Even though the school year is winding down, Kōkua Hawaiʻi Foundation is getting ready to bring on a surge of new 3R’s School Recycling Program schools for SY17-18. 1,000 new Kōkua Hawaiʻi Foundation recycling bins just arrived and we are looking forward to helping new schools begin their recycling programs, furthering our shared missions to educate students on the value of resource conservation. Our 3R’s School Recycling Coordinator is ready to assist your school. Email [email protected] for more information. Kōkua Hawaiʻi Foundation is looking forward to a strong partnership with Hawaiʻi State Department of Education Facilities Branch and West Oʻahu Aggregate (WOA) in the new school year. 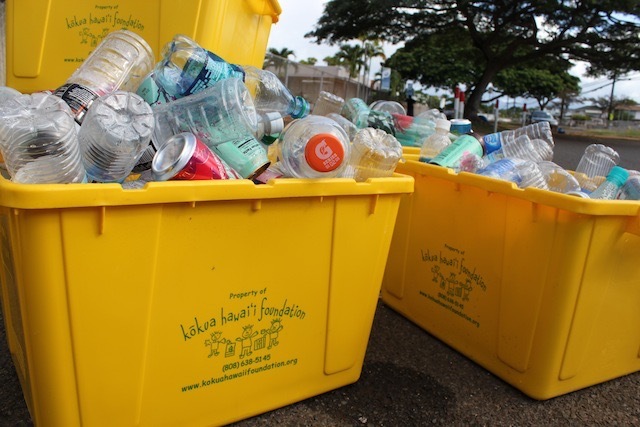 Together we will continue to spread the word that all Oʻahu schools have recycling services. Awareness will lead to an increase in recycling on Oʻahu and a decrease in contamination found in school recycling dumpsters.